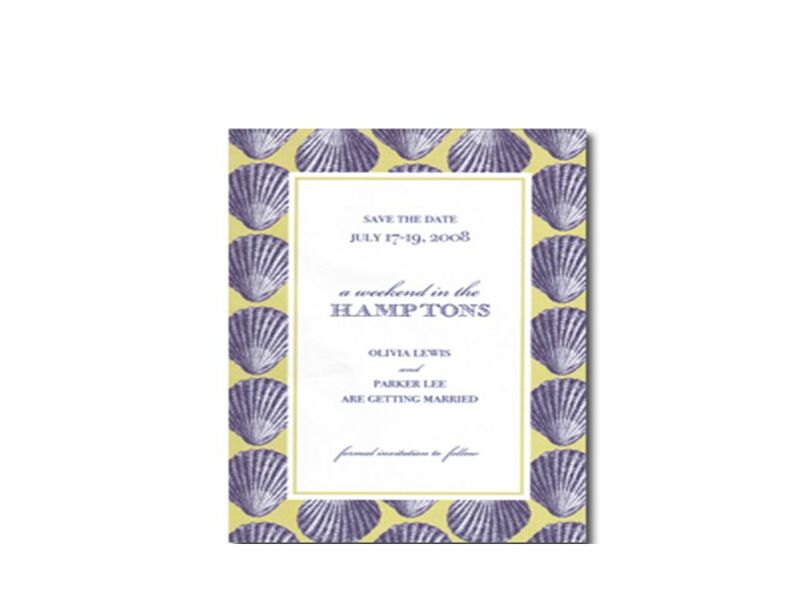 Invitations Invitations are essentially advertisements for your event. 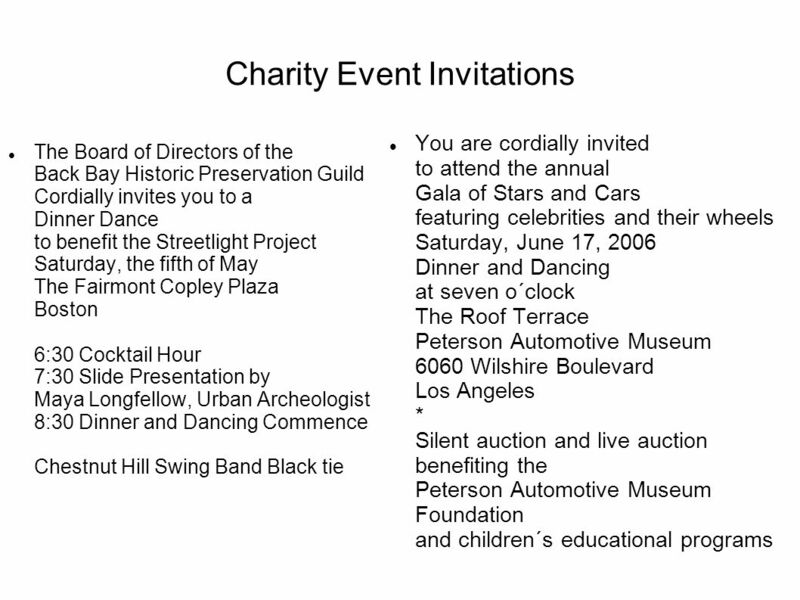 1 Invitations Invitations are essentially advertisements for your event. 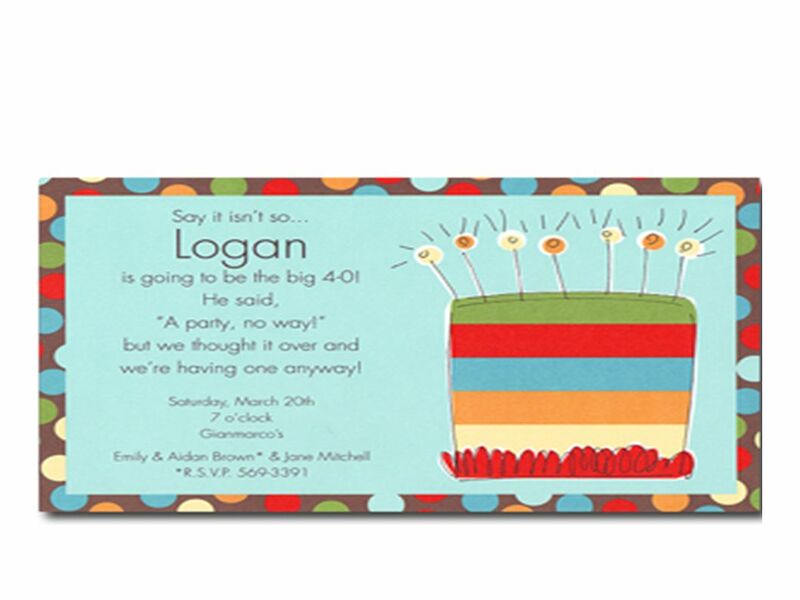 Invitations set the tone for your party. 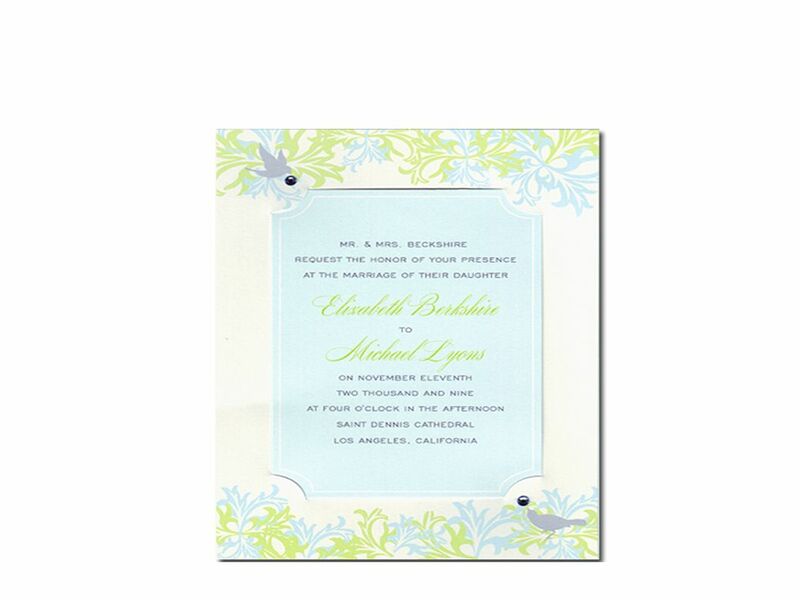 Make sure the style (writing and paper) of your invitation indicates whether your event is formal or informal. 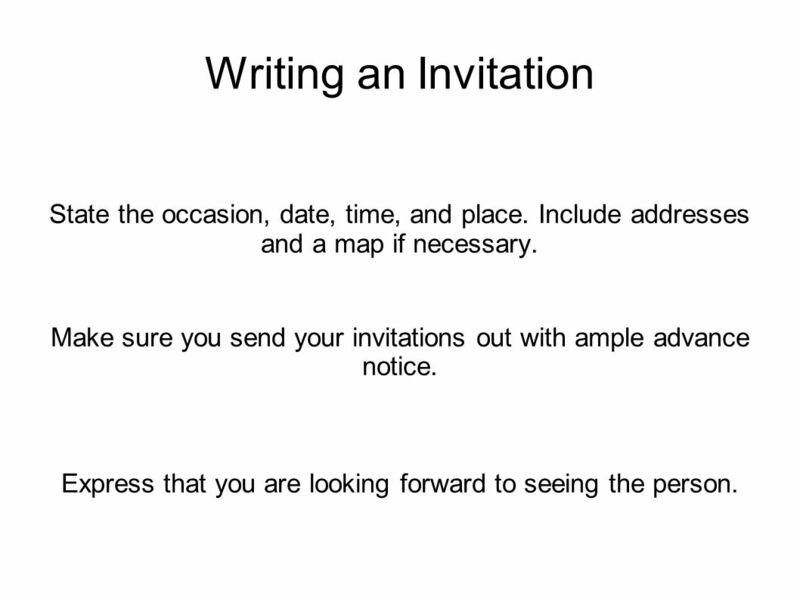 2 Writing an Invitation State the occasion, date, time, and place. Include addresses and a map if necessary. 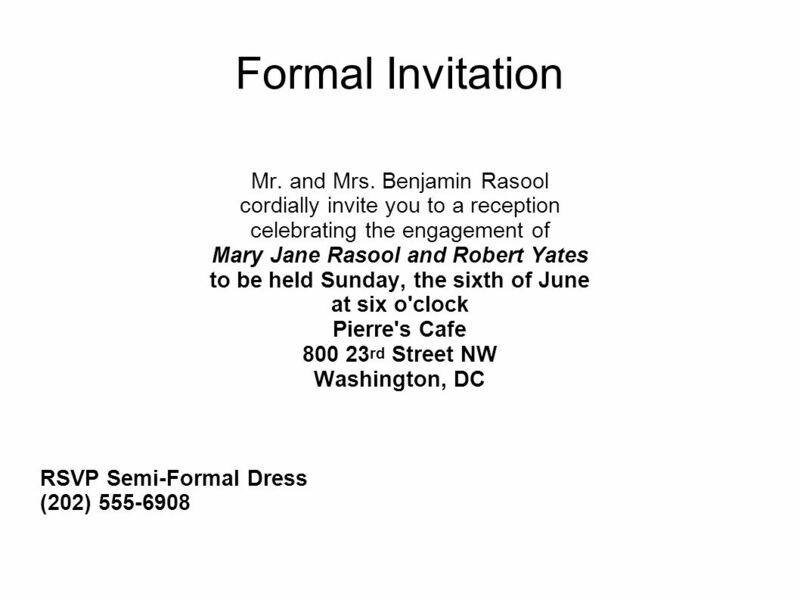 Make sure you send your invitations out with ample advance notice. Express that you are looking forward to seeing the person. 4 The Lower Part R.s.v.p. 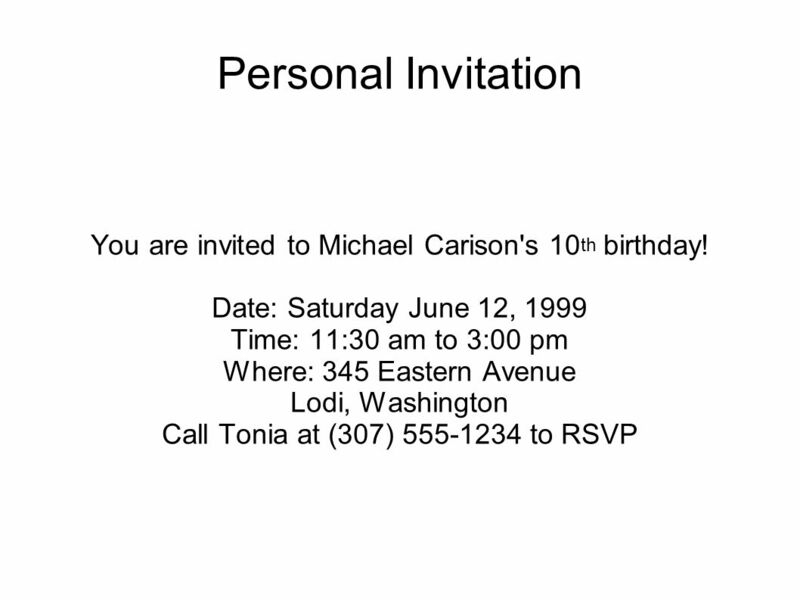 Mention if refreshments will be served. 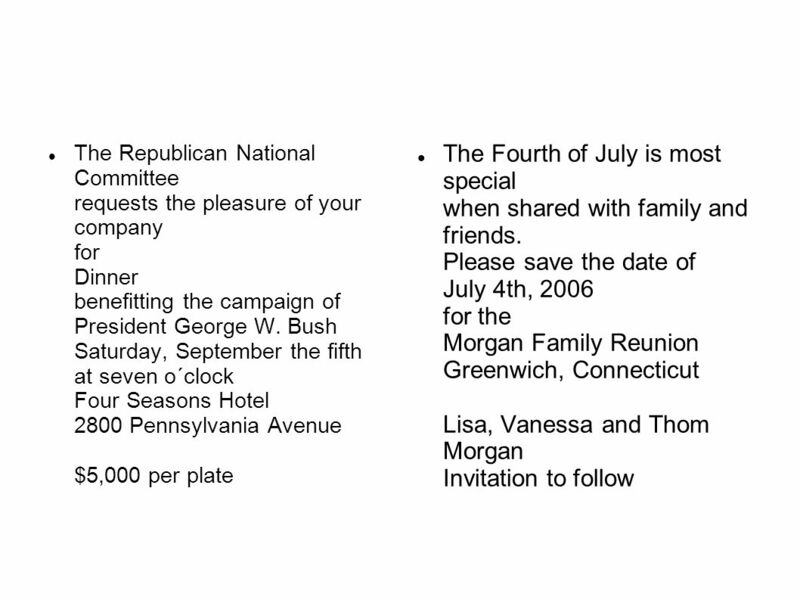 List any charges that may apply. 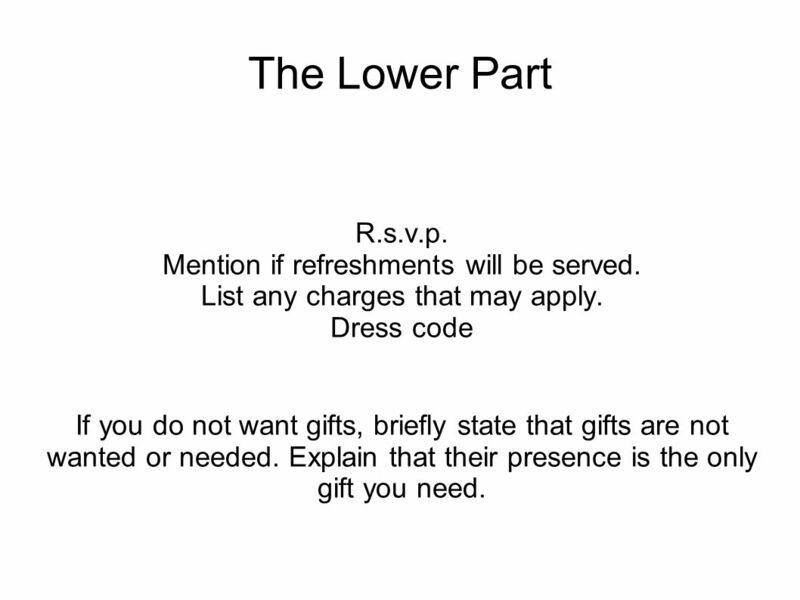 Dress code If you do not want gifts, briefly state that gifts are not wanted or needed. Explain that their presence is the only gift you need. 5 R.s.v.p. R.s.v.p. means "please reply." 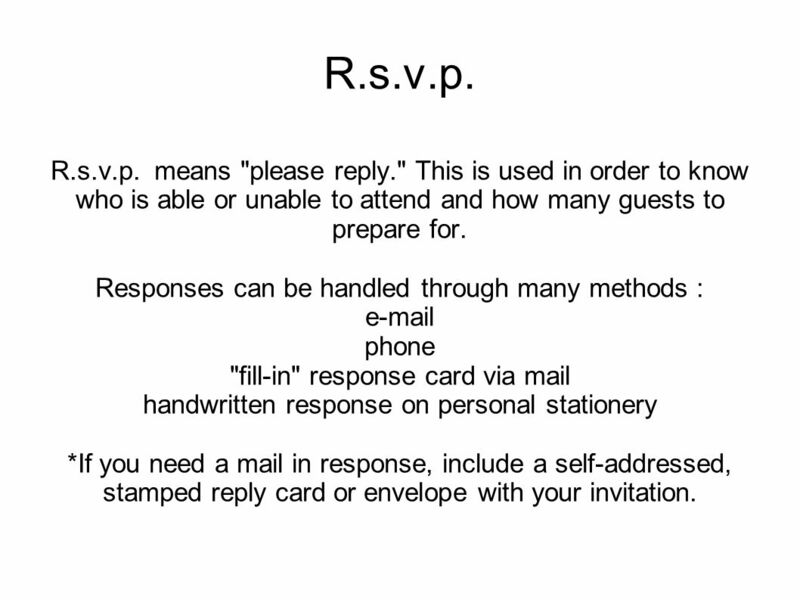 This is used in order to know who is able or unable to attend and how many guests to prepare for. 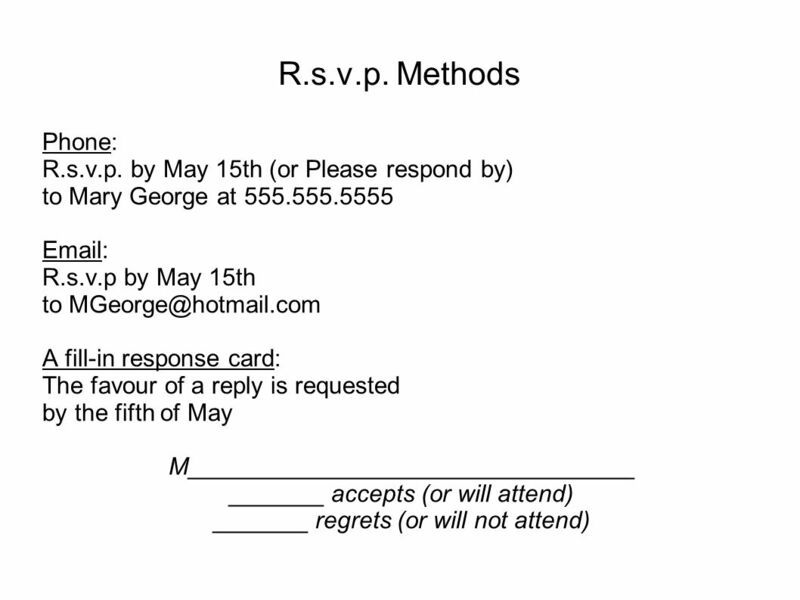 Responses can be handled through many methods : phone "fill-in" response card via mail handwritten response on personal stationery *If you need a mail in response, include a self-addressed, stamped reply card or envelope with your invitation. 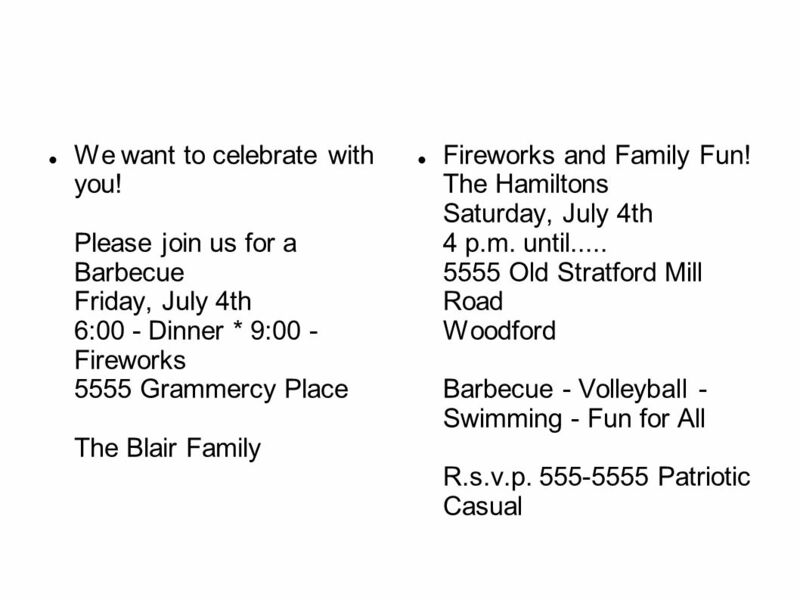 Cordially invites you to the 15th Annual Employees Appreciation Picnic. The whole family is welcome! 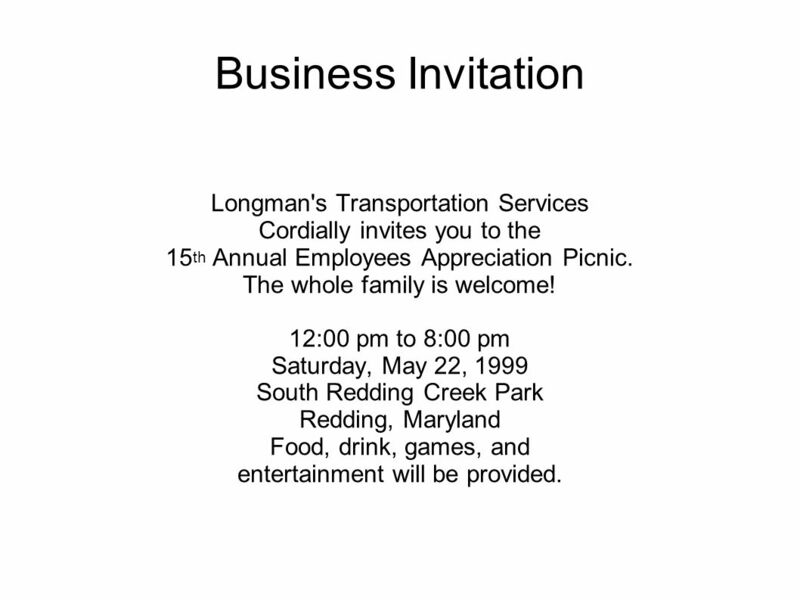 12:00 pm to 8:00 pm Saturday, May 22, 1999 South Redding Creek Park Redding, Maryland Food, drink, games, and entertainment will be provided. 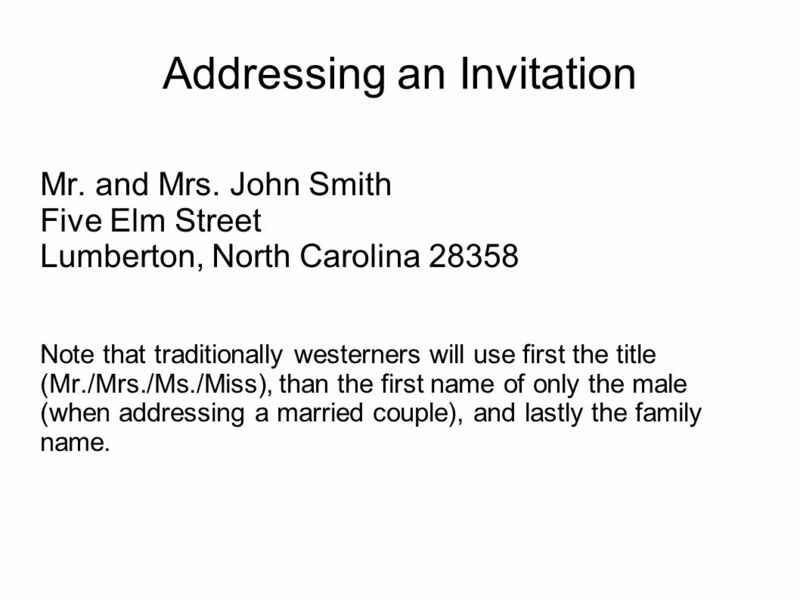 Mr. and Mrs. John Smith Five Elm Street Lumberton, North Carolina 28358 Note that traditionally westerners will use first the title (Mr./Mrs./Ms./Miss), than the first name of only the male (when addressing a married couple), and lastly the family name. 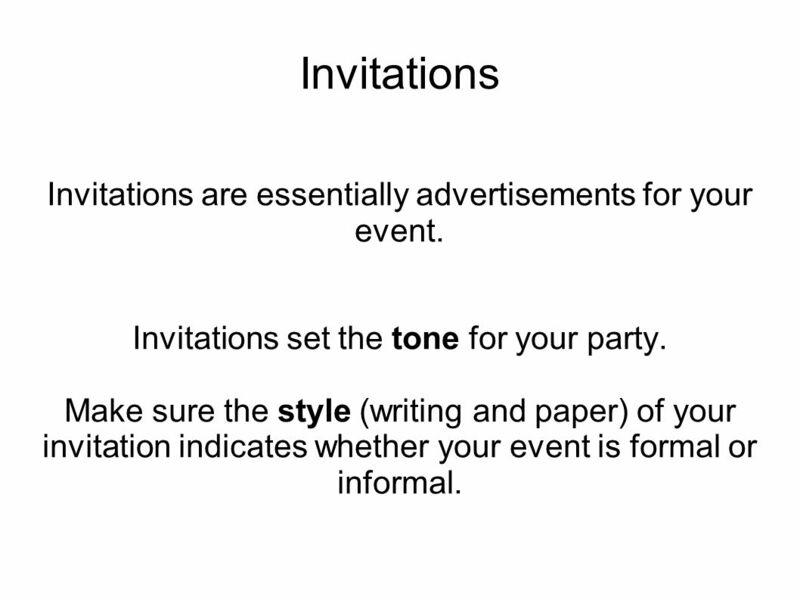 Download ppt "Invitations Invitations are essentially advertisements for your event." MONACO Accommodation This is a little hotel, located in the town center, 5 minutes from beaches, on the lower coastal road, between Nice and Monaco. Enochs High School Class of Graduation Ceremony Thursday, May 23, :00 pm in the EHS Courtyard Guests must each have a ticket to enter Balloons. House Meeting Sidney Graduate Community Tuesday, August 10 th, 2010 Pacific. Cougar News November 2011 Your Library Media Center We are bringing closure to our First Nine Weeks of this school year, and exciting things are. Day of Honour May 9, 2014 Ottawa Tribute Breakfast to the Families of the Fallen Sponsorship Package. : Unit 8 Love and Friendship / Write and Produce Write and Produce General Writing Practical Writing Write and apply Ex. 17 Write and correct Ex. 18 Write. 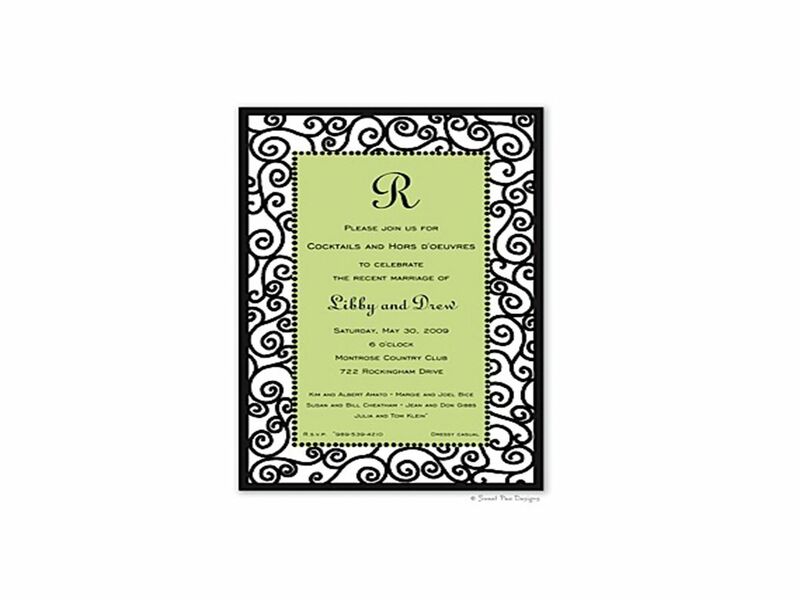 1 Notice Note Invitation Certificate By. 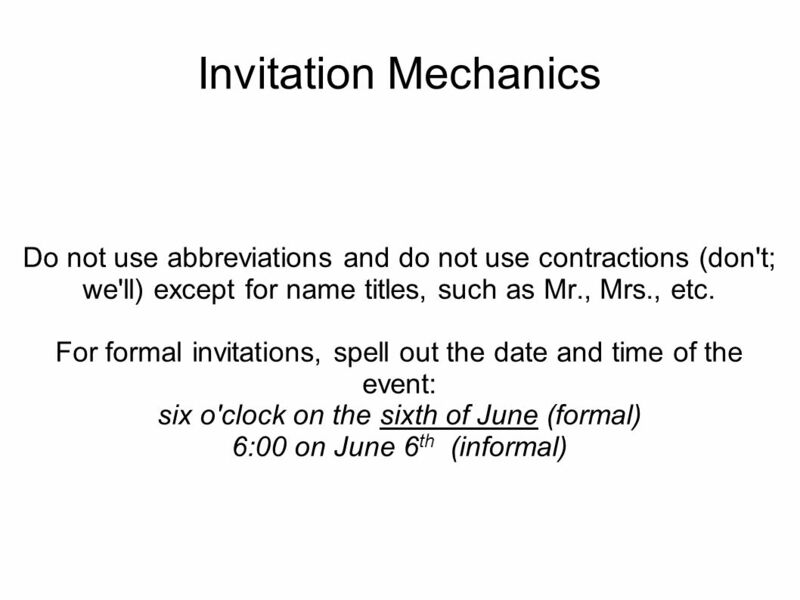 2 Notice writing Note writing Formal invitation Wedding invitation Formal acceptance Partial acceptance Formal. Bake Off Fundraiser Guam Society of America, Inc Memorial Day Picnic Fort Meade, Maryland, Burba Lake Pavilion #3 Saturday, May 28, 2011, 12–7 pm. Deacon Jones Foundations SUPER SEND-OFF 2011 Saturday & Sunday January 22 & 23, 2011 Pechanga Resort & Casino Temecula, CA... Sponsorship Opportunity Overview. City of Hallandale Beach Parks and Recreation. Swim Lessons Monday thru Thursday Classes: 4:00pm – 4:45pm, 4:45pm – 5:30pm, 5:30pm-6:15pm, 6:15pm-7:00pm. Kelseys 13 th Birthday Party!. Big Ticket Item My big ticket item is 2 hotel rooms. There is a swimming pool. The party starts on Friday night and ends. Welcome RMHS Senior Parents Tuesday, March 23, :30pm and 6:30pm. Welcome RMHS Senior Parents Tuesday, November 30, :30pm and 6:30pm. Convoy Cup Foundation and Dartmouth Yacht Club Host Convoy Cup 2006 September , 2006. What’s the Occasion? 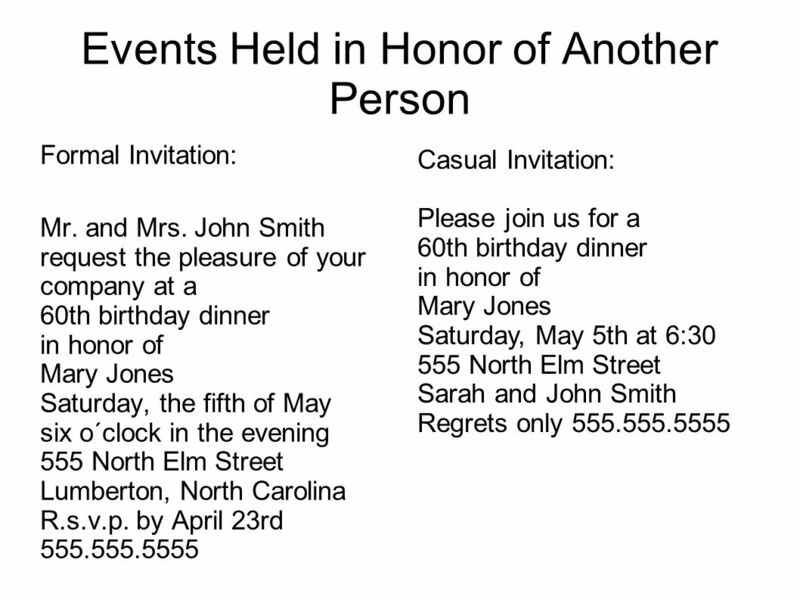 You’re invited to a surprise birthday party for Sandy Sykes! Hard to believe but she is approaching the BIG 50! She has spent more.